When I moved to Suburban Northern Virginia last year from light-polluted New York City, I gazed at the skies and rediscovered that the heavens consisted of more than an occasional moon. Although still effected by the lights of near-by Washington, DC, the sky seemed full of forgotten stars that had been unable to compete with the glitter and glare of Manhattan. The amateur scientist in me determined to get a telescope and explore these new found wonders. 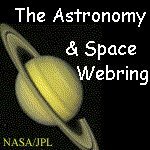 - Smithsonian Weekly Skywatcher's Report - night sky information for Washington, DC. - Monthly Star Chart - summary skywatching info and star chart. is owned by The Gray Wizard. 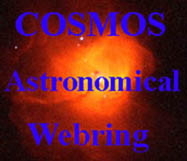 This Support Your Local Astronomer site owned by The Gray Wizard.